Interns often wear many different hats, being responsible for or involved in a handful of different projects at any given time. 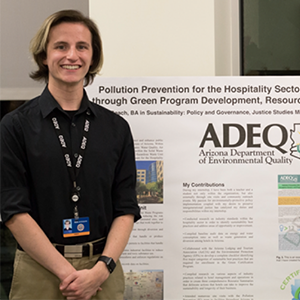 This was certainly true in the case of Justyn Beach, who obtained a Pollution Prevention (P2) Internship for the Hospitality and Lodging Sector with the Arizona Department of Environmental Quality (ADEQ). Justyn is a Sustainability undergraduate studying Sustainability with a Policy and Governance concentration and a minor in Justice Studies. From August to November of 2017 he created a comprehensive checklist of sustainable business practices for hotels, lodges, and resorts. It served as the bridge between sustainability and hotels, lodges, and resorts across the entire state of Arizona, and it was very difficult to create a statewide program that is large enough to be effective yet not so large that it becomes unwieldy. The checklist is part of a larger Green Certification Program that is currently being developed by the Arizona Lodging and Tourism Association (AzLTA) in conjunction with Arizona Department of Environmental Quality (ADEQ) and the Environmental Protection Agency (EPA). It’s a step toward creating a more sustainable, functional business model.Once the program and checklist are completed, hotels that want to become more environmentally-friendly, sustainable, and responsible will be able to opt into the program to participate. After being admitted to the program, hotels would go through the checklist, identify practices that they are already doing, outline areas for improvement, and then set goals to achieve more sustainability within their operations. They are then awarded certification levels that are based on their sustainable initiatives and commitments. The challenges that Justyn faced were mostly related to time management and the checklist itself in its sheer size and scope. This internship position had many components to it, and learning how to effectively manage your time in the office is critical. Between the site visits and educational seminar trainings, it became difficult to find the time to work on the checklist and the resource summaries. Resource summaries are double-sided informational sheets that provide resources and tools for organizations, industries, companies, corporations, entities, etc. Having good time management skills are key. Procrastination can be a huge detriment when you are a full-time student with an internship. Caroline Savalle is the Internship and Experiential Education Specialist for the School of Sustainability, and Justyn credits her in making him feel fully supported in his role as an intern and as a student working within an unfamiliar workforce. But Caroline Savalle is not the only person that Justyn credits for making his internship possible. He learned a great deal from the Pollution Prevention team about some of the best ways to go about reducing pollution in many industries and was able to collaborate with the Recycling Coordinator as well to come up with different diversion strategies for certain areas. Justyn also collaborated with the Pollution Prevention Region 9 representative, Wendi Shafir, at the EPA, who he says taught him a lot about designing and implementing a project of this size and scope. “Truly I would not have been able to accomplish the work without [Wendi’s] continuous support,” he says. An internship of this magnitude takes quite a bit of planning and organization skills. By the end of his internship he was able to establish or further sustainability programs in a multitude of facilities that cater to tourists. To future interns, Justyn says to be cognizant of the due dates, appointments, meetings and conferences and that you may have to use new tools to manage some of your more important tasks. Learning these new tools is all a part of the learning process that makes an internship so great for students.